At Sun, he was deeply involved in designing some of the top 10 supercomputers in the industry and led the high performance computing practice in the Asia-Pacific region. At the Yale Investments Office he helped in valuing complex clean energy financial instruments with multiple risk factors. As a student at Yale, Deepak played a key role in starting the first university-wide energy club, the YCEI Student Congress. 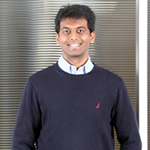 Deepak is a graduate of the National University of Singapore, earning a B.Eng. in Computer Engineering; the Singapore-MIT Alliance, earning a S.M. in Computer Science; and the Yale School of Management, earning an M.B.A.